With Von Holt Wines' 2015 Linden Ridge Vineyards Rosé of Grenache, we think we have achieved a stupendously refreshing wine for these hot summer months, with juicy notes of melon and citrus. It is ready to drink now, so we thought what better to pair it with than something you can cook on your outdoor grill while enjoying the company of your friends and family? 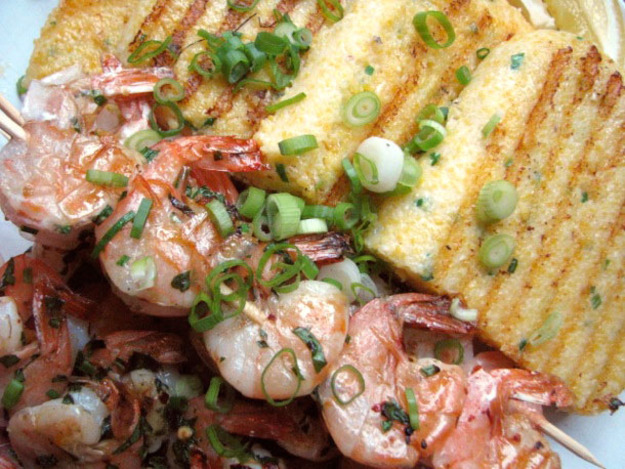 And for our city-bound friends sweltering through the dog days of summer without access to a traditional grill, this simple yet elegant dish of shrimp and polenta can just as easily be cooked on a grill pan. Butter an 8"x8" Pyrex dish. In a heavy bottomed saucepan, combine milk, cornmeal, and butter, and bring to a simmer, stirring constantly, over medium high heat. When mixture begins to simmer, add sugar, salt, and chives, and keep stirring until thick, about 15 minutes (when it is getting thick enough, the polenta will begin to pull away from the sides slightly as you stir). Pour into prepared pan and allow to cool and thicken until thick enough to slice, about 3 hours. Place shrimp, olive oil, salt, pepper, oregano, and basil in a large bowl and toss to combine. Thread onto skewers (soaked wood or metal); place in the fridge until polenta has set. When polenta has set, carefully flip the Pyrex dish and un-mold the polenta onto your cutting board, and cut into 4 even pieces. Preheat grill or grill pan to high heat. Gently grill polenta slices until grill marks form, and polenta is heated through, about 8 minutes. Remove from grill and reserve. Grill shrimp skewers until shrimps are pink and beginning to char, about 3 minutes per side. Serve with some sliced scallions for garnish. Open a slightly chilled bottle of Von Holt Wines’ 2015 Rose of Grenache. and enjoy the fruits of your labor with the fruits of ours. Your friends at Von Holt Wines.